Introduction. When it comes to taxes many people seem to believe that they will never go away, and they can’t be discharged in bankruptcy. A great bankruptcy attorney can help. I’m happy to report that this perception is not entirely true. While it is true that some taxes cannot be discharged, and special rules apply to taxes so they are not like ordinary debts, at least some taxes can be discharged in bankruptcy. That means they disappear forever. Trust fund taxes. The two most common types of taxes that individuals are assessed with are income taxes and trust fund taxes. Trust fund taxes cannot be discharged. These kinds of taxes mostly apply to business owners. They are taxes that are collected from a third party to be paid over to someone else, i.e., the government. For instance, when an employer withholds income tax, Social Security tax, and Medicare taxes from an employee, these taxes are supposed to then be paid to the U.S. Treasury. In essence, the employer holds the money in trust to be paid over to the government. The same is true of sales taxes and other state non-income taxes. If the taxes are not paid to the government, the individual business owner is often assessed for these taxes, but they are not dischargeable in bankruptcy by either the owner or the business. i. Three-Year Rule: The tax year in question is one for which the return was last due, including extensions, more than three (3) years before the filing date of the bankruptcy petition. The three-year period is computed from the most recent date of the tax return due for the tax year (typically April 15 of the year following the taxable year). An extension to file the return delays the eligibility date to the next due date even if the return is filed earlier. 11 (a)(8)(A)(i). ii. Two-Year Rule: A tax return has been filed by the debtor/taxpayer or the tax year(s) in question are at least more than two (2) years preceding the filing date of the bankruptcy petition. 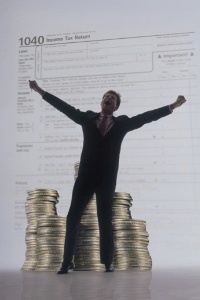 Even when no tax return is filed, the tax may still be dischargeable in a Chapter 13. 11 U.S.C. §(a)(1)(B). iii. 240-Day Rule: The tax liability sought to be discharged was first assessed at least more than 240 days preceding the filing date of the bankruptcy petition (plus any period of overlapping time during which an offer in compromise made during such day period was pending, plus 30 days). This rule is designed to avoid a situation, in which a taxpayer files an offer in compromise to delay collection, and then withdraws it and immediately files bankruptcy. 11 U.S.C. §507(a)(8)(A)(ii). iv. Non-Fraudulent Return: The tax return in question must be non-fraudulent. 11 U.S.C. §523(a)(1)(C). v. No Willful Tax Evasion: The debtor/taxpayer has not engaged in an activity that is deemed to be a willful attempt to defeat or evade the tax. 11 §523(a)(l)(C). vi. Assessable But Not Yet Assessed: The tax claim has not been assessed before but is assessable, under applicable law or by agreement, after the commencement of the case and does not relate to (1) an unfilled tax return, (2) a return filed late but within two years before the petition filing date, (3) a fraudulent return, or (4) a situation where the debtor willfully attempted to evade a tax. 11 §507(a)(8)(A)(iii); 11 U.S.C. §523(a)(1)(B)(i) or (ii) and 523(a)(1)(c). vii. Lien Remains on Exempt Assets. B. Chapter 13 — Determining Factors for Discharge of Taxes in Chapter 13 Based on Rules for Discharging Taxes in Chapter 7.
i. The Three-Year Rule, always applies. ii. The Two-Year Rule, doesn’t apply. iii. The 240-Day Rule, may apply. iv. Fraudulent Return, doesn’t apply. v. No Willful Tax Evasion, doesn’t apply. vi. Assessable But Not Yet Assessed, will apply but only if the debtor was a compliant taxpayer. II Substitute for Return. If for some reason you did not file a return and the IRS filed a return for you, that disqualifies that year for which a return was filed by the IRS for a discharge even if you later file your own return. Typically a return filed by the IRS is not accurate because it does not allow for deductions or credits the taxpayer might be entitled to take. But even if the taxpayer later files his own return, the filing by the IRS renders that year non-dischargeable forever. The right attorney. The above list is a summary of the most common rules affecting dischargeability. However, there are other technical rules that can also impact dischargeability, and specifically your case, so as you can see, the discharge of taxes is a highly technical area and should not be attempted without consulting with an experienced attorney in both tax and bankruptcy laws such as Setareh Mahmoodi. We look forward to helping you. We are a debt relief agency. We help people file for bankruptcy relief under the Bankruptcy Code. Our bankruptcy attorneys are here to help!